This wallpaper and the accompanying Floret Border were hung in the 1768 Jeremiah Lee Mansion in Marblehead, Massachusetts. The opulent Georgian mansion, which has been owned and preserved by the Marblehead Museum and Historical Society since 1909, features rococo interior carvings as well as early English hand-painted scenic papers from the 1760s. The Pagodas pattern is representative of many of the chinoiserie designs popular in the mid-to-late 18th century. It was probably inspired by an engraved design published by Jean Baptiste Pillement, the source for much of the chinoiserie used as rococo ornamentation. 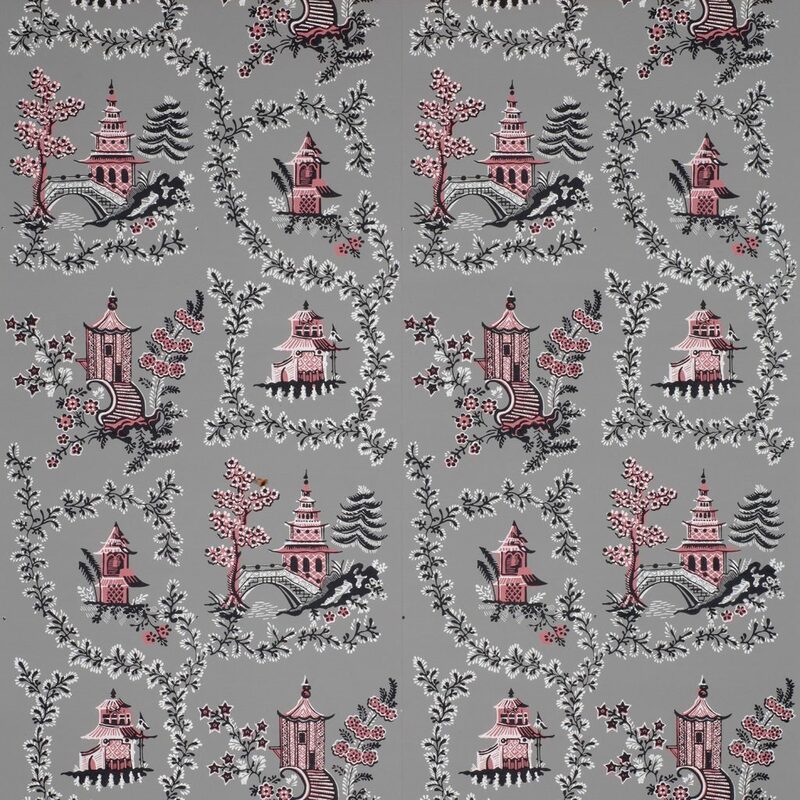 Adelphi offers the paper in its original colorway of pink, white and black printed on a deep grey ground. Another period colorway would employ the same printed colors on either deep blue or turquoise. This pattern was chosen by Colonial Williamsburg for an upstairs bedchamber in the Peyton Randolph house.